Amazon.com, America’s retail behemoth, dominated headlines in August when it completed its acquisition of Whole Foods in early August 2017. Having officially taken control of the up-market grocer, which focuses on premium quality produce, market observers and consumers alike are eagerly awaiting Amazon.com’s pricing strategy. At the heart of Amazon.com’s seemingly unstoppable growth trajectory is the company’s ability to understand consumers, complemented by deep insights into buying cycles and purchase decisions and preferences. It also helps that Amazon.com boasts one of the planet’s mightiest marketing and publicity machines. Is Amazon.com About To Launch A Grocery Price War? Reports of Amazon.com dropping Whole Foods prices by up to 43 percent quickly made splashes across the news media. Given Jeff Bezos has been quoted in the past as saying, “your margin is our opportunity”, an aggressive promotional campaign to achieve dominance for its new Whole Foods acquisition was anticipated by some commentators. These sentiments ignited fears of a profit-sapping price war, immediately hit stock prices in the cutthroat grocery industry, which survives on famously thin margins. Memories of Amazon.com’s impact on US department store profitability quickly surfaced with analysts pointing to Walmart’s revenue/market share plunge from 26 percent in 2005 to just 11 percent in 2016 when the sector came under sustained pressure from Amazon.com. How Deep Are Amazon.com’s Price Cuts Really? At DataWeave, a Competitive Intelligence as a Service provider for retailers and brands, we put Amazon.com’s actual Whole Foods discounts under the microscope. The resulting careful analysis of price discounts revealed quite a different story to the one initially featured in the media. Scrutiny by our proprietary data aggregation and analysis platform showed the drop in retail grocery prices was minimal to almost negligible, depending on the category. In delivering near-real-time competitive insights to retailers and brands, we acquire and compile large volumes of data from the Web on an ongoing basis. A key differentiator is our ability to aggregate data down to a zip-code level. Our analysis of Amazon.com’s reported drop in prices was based on data acquired for 13 zip-codes distributed across the country and selected at random. Our platform compared market prices by zip code valid between 23rd August and 30th August. Each zip code indicated the overall average discount offered varied between 0.20 percent and -0.20 percent. When the discounts at a category-level were separated out, the discounts available to customers per category varied between -6.8 percent (an actual price increase) and 6.1 percent. 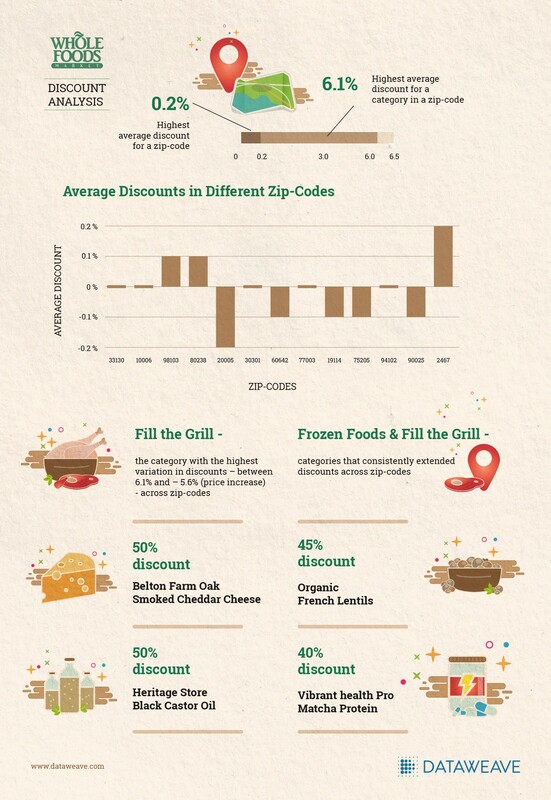 Moving on to the “Fill the Grill” category, discounts again were modest, varying between -5.6 percent (another price increase) and 6.1 percent across the zip codes analyzed. This aligns with Amazon.com’s recognized preference for basing its strategy on competing on breadth and depth of product assortment rather than pure pricing discounts at the checkout. Hass Avocado: 50 percent (confined to one zip-code). Amazon.com’s marketing engine is renowned for skillfully nurturing consumer price perceptions of the giant retail website as being the lowest priced retailer. We kept a keen eye on Amazon’s pricing these past weeks, and unearthed a carefully conceived and executed Whole Foods pricing campaign, which is yet another example of their market shaping expertise at work. If you’re intrigued by DataWeave’s technology and would like to learn more about how we help retailers and brands build and maintain a competitive edge, please visit our website!